About "Adding and subtracting decimals worksheets 5th grade"
On the webpage, "Adding and subtracting decimals worksheets 5th grade" we are going to see practice problems of adding and subtracting decimals. In the above addition of decimals, 7.6 is taken as 7.600 and 28.07 is taken as 28.070. Because the last decimal number has 3 digits on the right side of the decimal point. Let us see the solution of the next problem on "Adding and subtracting decimals worksheets 5th grade". In the above addition of decimals, 14.2 is taken as 14.200 and 16 is taken as 16.000. Because the last decimal number has 3 digits on the right side of the decimal point. 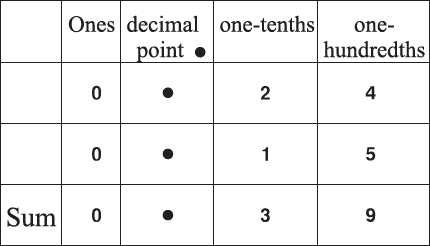 In the above addition of decimals, 3 is taken as 3.000.Because the first and second numbers have 3 digits on the right side of the decimal point. 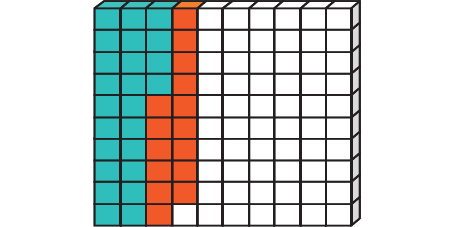 In the above addition of decimals, 39 is taken as 39.000. Because the first number has 3 digits on the right side of the decimal point. In the above subtraction of decimals, 18 is taken as 18.00. Because the second decimal number has 2 digits on the right side of the decimal point. 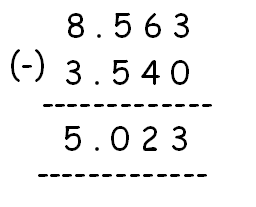 In the above subtraction of decimals, 3.54 is taken as 3.540. Because the first number has 3 digits on the right side of the decimal point. We can not imagine the subject Math without the term "Decimal". Because, we solve many problems with it. So, we must be aware of adding and subtracting decimals. 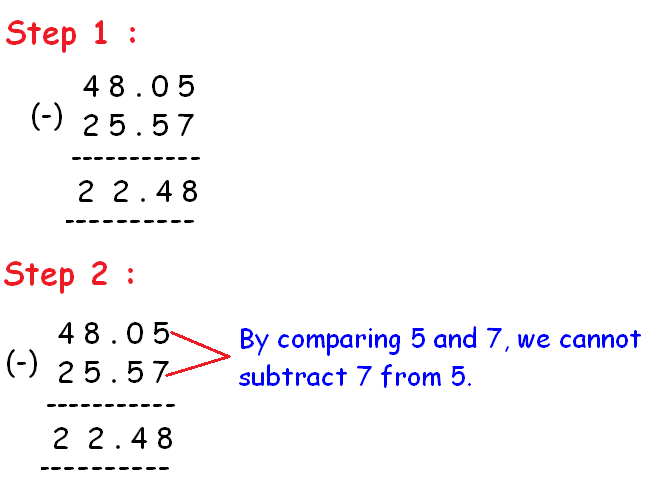 To know about how to add or subtract decimals, let us look into the following stuff. Let us see, how to add the decimals 0.24 and 0.15. Observe the figure given below. In both the methods, arrange the decimal numbers according to the place values and add them. 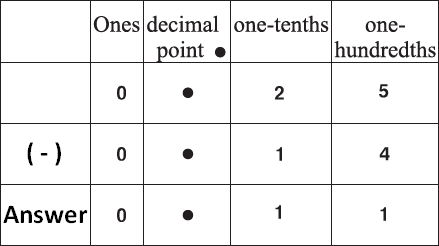 In the above addition of decimals, 0.2 is taken as 0.20, as the first decimal number has two digits on the right side of the decimal point. In both the methods, arrange the decimal numbers according to the place values and subtract them. After having gone through the stuff given above, we hope that the students would have understood "Adding and subtracting decimals worksheets".